↑ SI supports only the use of symbols and deprecates the use of abbreviations for units. "Bureau International des Poids et Mesures" (PDF). 2006. p. 130. Retrieved 21 November 2011. 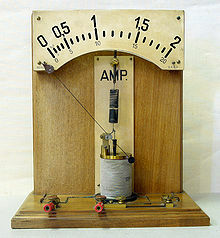 ↑ "BIPM - ampere". www.bipm.org. Retrieved 2017-01-31. ↑ Serway, Raymond A; Jewett, JW (2006). Serway's principles of physics: a calculus based text (Fourth ed.). Belmont, CA: Thompson Brooks/Cole. p. 746. ISBN 0-53449143-X. ↑ Beyond the Kilogram: Redefining the International System of Units, USA: National Institute of Standards and Technology, 2006, Archived from the original on 21 March 2008, https://web.archive.org/web/20080321221139/https://www.nist.gov/public_affairs/newsfromnist_beyond_the_kilogram.htm, retrieved on 3 ਦਸੰਬਰ 2008 . ↑ (PDF)The International System of Units (SI) (8th ed. ), Bureau International des Poids et Mesures, 2006, p. 144, http://www.bipm.org/utils/common/pdf/si_brochure_8_en.pdf .